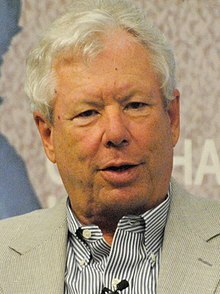 Richard H. Thaler (/ˈθeɪlər/; born September 12, 1945) is an American economist of Jewish descent. He is best known for being a theorist in behavioral finance. He was awarded the 2017 Nobel Prize in Economics for improving behavioral economics. ↑ Appelbaum, Binyamin (9 October 2017). "Nobel in Economics Is Awarded to Richard Thaler". The New York Times. Retrieved 9 October 2017. ↑ Gauthier-Villars, David (9 October 2017). "Nobel Prize in Economics Awarded to American Richard Thaler". The Wall Street Journal. Retrieved 9 October 2017. ↑ Keyton, David; Heintz, Jim (9 October 2017). "American Richard Thaler wins Nobel Prize in Economics". Associated Press via USA Today. Retrieved 9 October 2017. ↑ Tetlow, Gemma (9 October 2017). "Richard Thaler awarded 2017 Nobel prize in economics". Financial Times. Retrieved 9 October 2017. This page was last changed on 15 October 2017, at 00:16.